In February, the Port Authority announced a five-year, $US364 million project to repair damage inflicted on the tunnel by Hurricane Sandy. While it’s not as famous or tourist-friendly as the Empire State Building or Brooklyn Bridge, the Holland Tunnel, which connects Lower Manhattan and Jersey City, is one of New York City’s most important landmarks. It was also an innovative piece of engineering. Before it was built, the project’s engineers had to figure out how to make sure the tunnel’s occupants wouldn’t be exposed to dangerous levels of carbon monoxide from exhaust fumes. 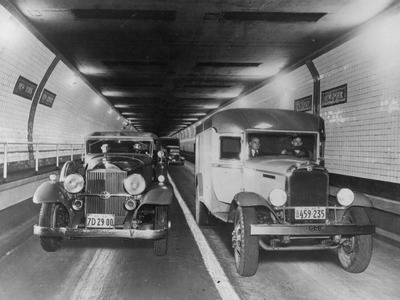 They eventually devised a new system in which air ducts placed beneath the road would allow clean air into the tunnel, while exhaust ducts located above vehicles would carry fumes out of the tunnel. The system became the template for future tunnels designed for automobiles. The tunnel has survived a number of hardships dating back to the years it spent under construction, when its first two lead engineers died before its opening. Since then, the bridge has experienced a massive fire and damage from the 30 million gallons of water that filled it during Hurricane Sandy. The latter inspired the Port Authority to announce a five-year, $US364 million repair project in February. The project is set to begin in the second quarter of 2019. The project will be comprehensive, touching on the tunnel’s structure and internal systems, and will ensure the tunnel remains usable for future generations. In 1906, joint commissions formed between New York and New Jersey began to come up with plans for a Hudson River crossing. Early ideas focused on bridges, but a 1913 cost estimate led to the realisation that, at a cost of $US50 million, a bridge would be about five times as expensive as a tunnel. The project’s engineers had to find a way to deal with tailpipe emissions. Clifford Milburn Holland was named the project’s lead engineer in 1919, and his biggest challenge was to figure out a way to prevent exhaust fumes from getting trapped in the tunnel and becoming harmful to drivers. He settled on a ventilation system that would send clean air from ducts placed beneath the road and remove fumes through ducts located above vehicles that would lead to ventilation towers above the tunnel. In 1924, Holland suffered a nervous breakdown due to stress from the project and died from a heart attack. His successor, Milton Freeman, died from pneumonia less than a year later. The project’s third lead engineer, Ole Singstad, carried out the rest of the tunnel’s construction until it opened in 1927. At the time it opened, it was the world’s longest underwater tunnel. The Holland Tunnel is around 1.6 miles long and has a diameter of 29.5 feet. It was the world’s longest, continuous underwater tunnel when it opened, but it’s since been surpassed. Now, it’s not even the longest underwater tunnel in New York, a distinction that belongs to the 1.7-mile Brooklyn-Battery Tunnel. In 1949, a tractor-trailer carrying over 4,000 gallons of carbon disulfide set off a series of explosions when one of the drums carrying the liquid fell from the vehicle and caught fire. The incident injured 66 people and caused extensive damage to the tunnel’s ceilings and walls. 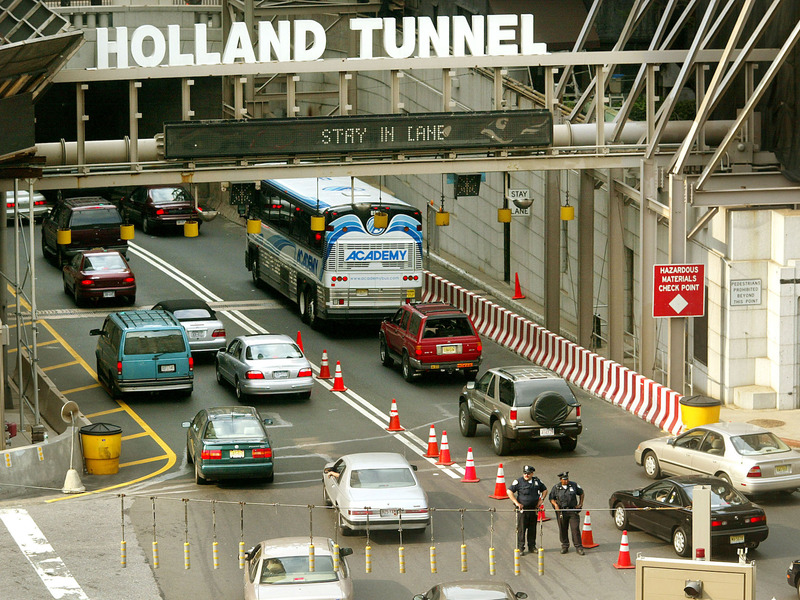 But the Holland Tunnel survived and would later be recognised for its historical and scientific importance. In 1984, the American Society of Civil and Mechanical Engineers named it a National Historic Civil and Mechanical Engineering Landmark, and in 1993, the US Department of the Interior designated it as a National Historic Landmark. Hurricane Sandy filled the tunnel with 30 million gallons of water in 2012, leading the Port Authority to announce a five-year $US364 million repair project in February. The project is expected to begin in the second quarter of 2019 and address damage to the tunnel’s structure and internal systems.